As we learn how to best serve our clients, we are implementing as many tools for your time-savings and efficiencies as we can. On the home-screen, you'll see we've added a new Dashboard containing two initial widgets. Keep an eye out for new updates to the homepage dashboard as we are creating this to be your central hub to success! Get Things Done! 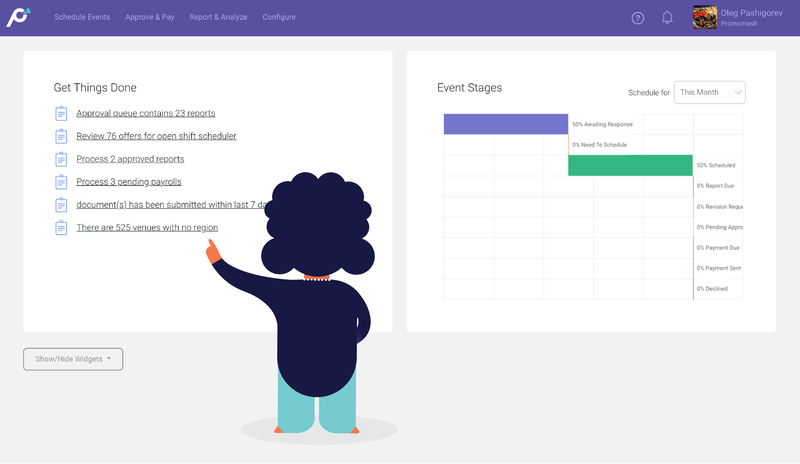 With this new widget, you will see all the important action steps in the system you currently need to take care of. This includes approving reports, managing payroll and event details, along with much more! We're continually working to improve our system and hope you utilize all the tools we are starting to roll out.